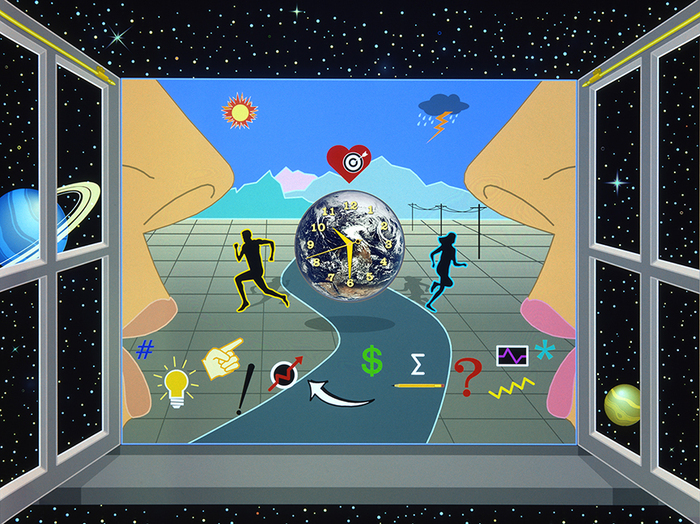 Preston, who is a published artist, writer and educator originally from Louisiana, works as a freelance illustrator, digital artist, graphic designer and voice over actor in the Los Angeles area. He earned an M.F.A. (with honors) in Illustration from the Academy of Art University in San Francisco and a B.A. in Applied Arts from the University of Louisiana at Lafayette. 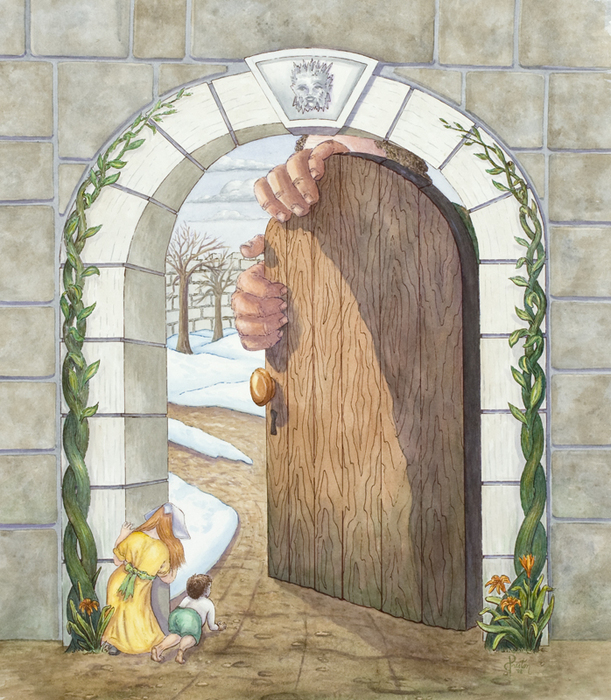 He is experienced in creating book and magazine illustrations, computer graphics/graphic design, fine art (portraits, landscapes, fantasy) and scenic art/murals. 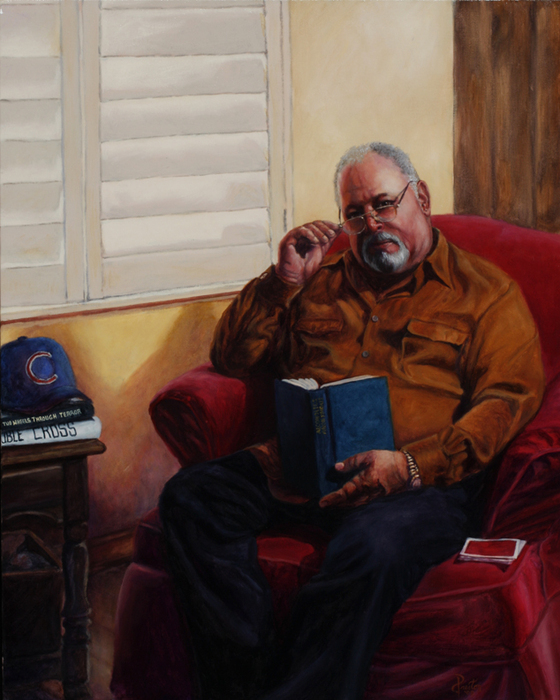 Involved with social issues and an avid artist rights advocate, he has been recognized by the Los Angeles City Council for his volunteer work and contribution to the growth of the arts in L.A. His award winning work has been exhibited both nationally and internationally. 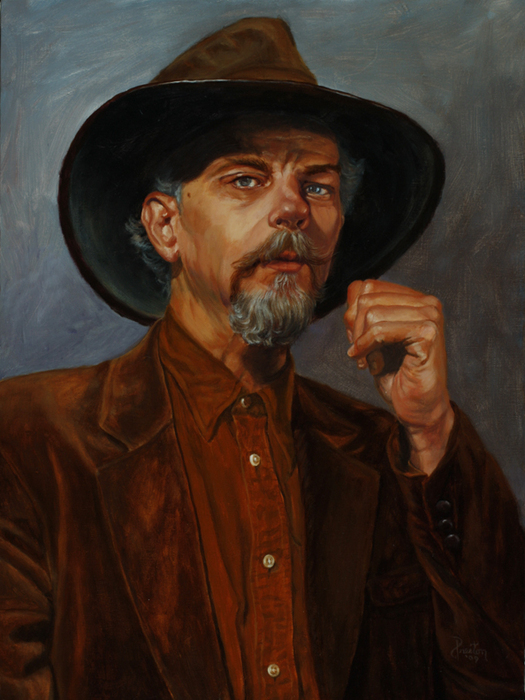 In 2013, one of his landscape paintings was chosen to be published in North Light Books’ - Acrylic Works: Best of Acrylic Competition and one of his portraits was selected for inclusion in the International Society of Acrylic Painters Best of Acrylic International Competition. 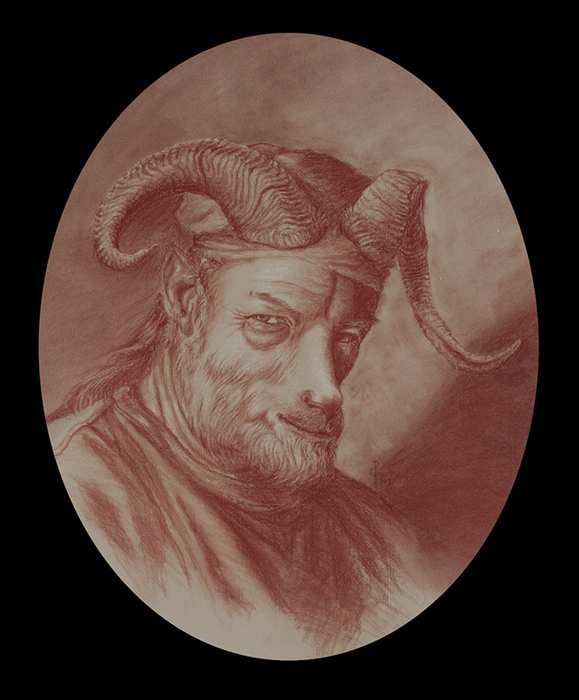 In addition, his illustration work got an award from the Adobe Design Achievement Awards in 2011 and he received an award of recognition from the Phi Kappa Phi Honors Society and the National Scholars Honors Society in 2007. 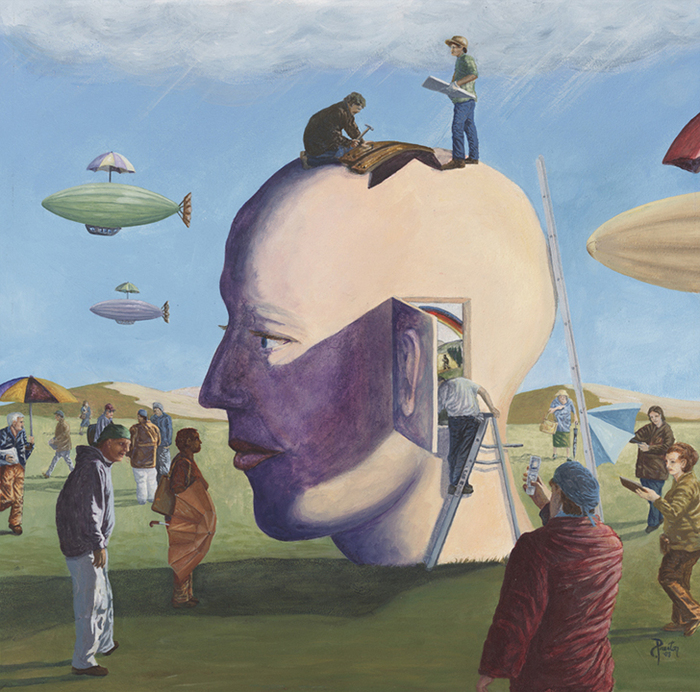 Also, he was hon¬ored twice with an Artistic Director Award for Set Design/Scenic Art from the Valley Theatre League for produc¬tions of the Road Theater Co.
His mural work can be seen in a project dubbed the “Hollywood Night Gallery” on Hollywood Blvd. and in a mural honoring Bob Barker at CBS Studios. Some of his scenic work can be seen at Venus Fort (a 60,000 sq.ft. shop¬ping center in Tokyo, Japan), the Paris Casino in Las Vegas and other venues around L.A. An exhibition of his “Twisted Teddys” series took place at the Hive Gallery in Los Angeles and his award-winning work continues to be exhibited locally, nationally and internationally. He has traveled extensively; living & working at times in Norway, England, Italy and Japan. 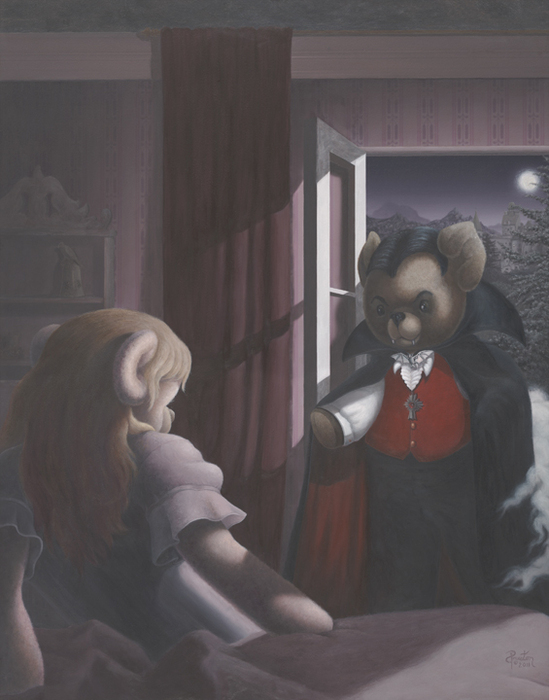 This portfolio includes examples from my fantasy, science fiction, narrative, editorial and twisted teddys artwork. 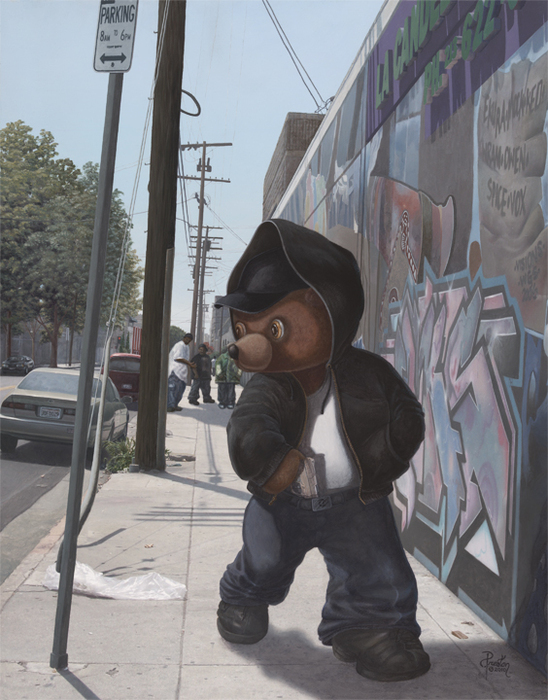 Created in Acrylic and Photoshop, this piece depicts a Gangsta Teddy walking down a sidewalk toward the viewer; a graffiti wall is on his left. He is looking back over his shoulder as he pulls a gun from his waistband, getting ready to unload in on a small group of youth in the distance. 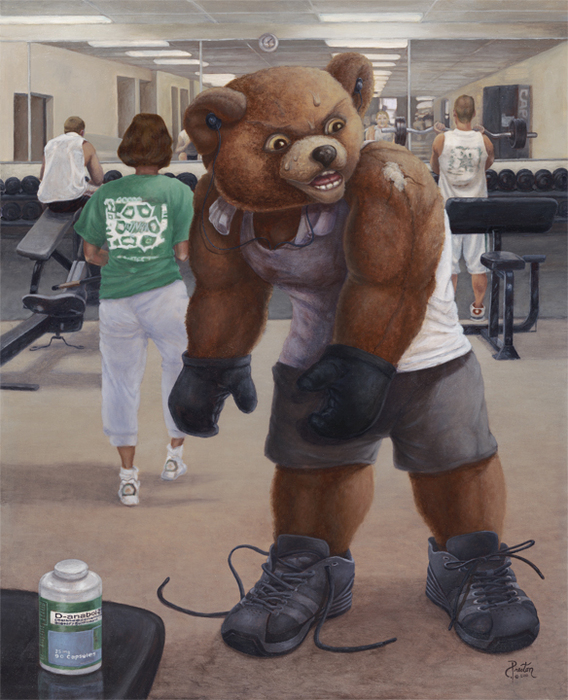 Created in Acrylic, this depicts a bodybuilder teddy bear, who has become so pumped up on steroids, that he can't bend over to tie his shoe and in his frustration and anger, has popped a stitch in his shoulder. Created in Acrylic, this piece is a commentary on the lack of availability of arts classes in our public school system, creatives often result to street art. 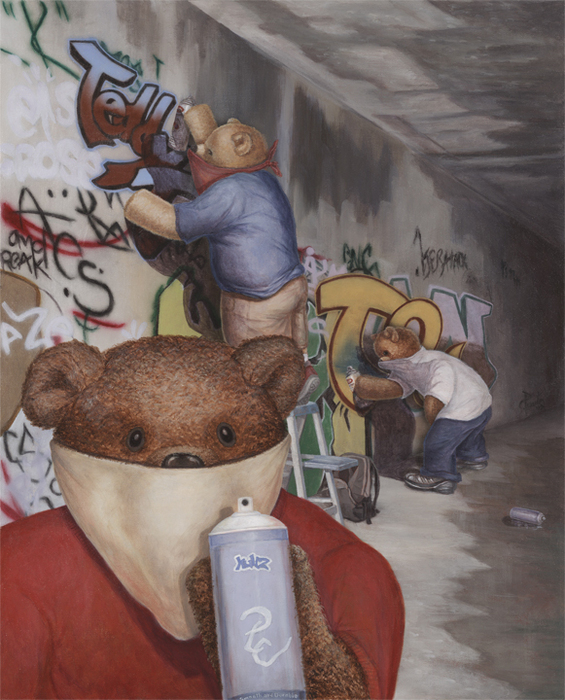 This picture depicts 3 teddy bears engaged in the art of "tagging" as an outlet for their creative expression. A female teddy in her bedroom is transfixed by the stare of the Dracu Teddy that has just entered her boudoir. I created this piece as a commentary on innocence that is damaged or perverted by outside forces. This is a piece I created digitally using photoshop and painter. 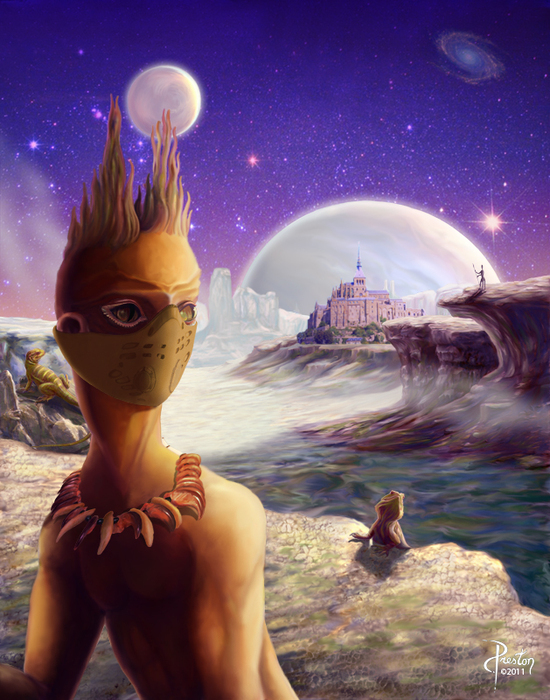 It depicts a scene on an alien world where a being has been exiled from its home. It takes one last look over it's shoulder as it heads off into the wilderness. Created digitally using photoshop and illustrator, this scene depicts the age old battle of communication between women and men. 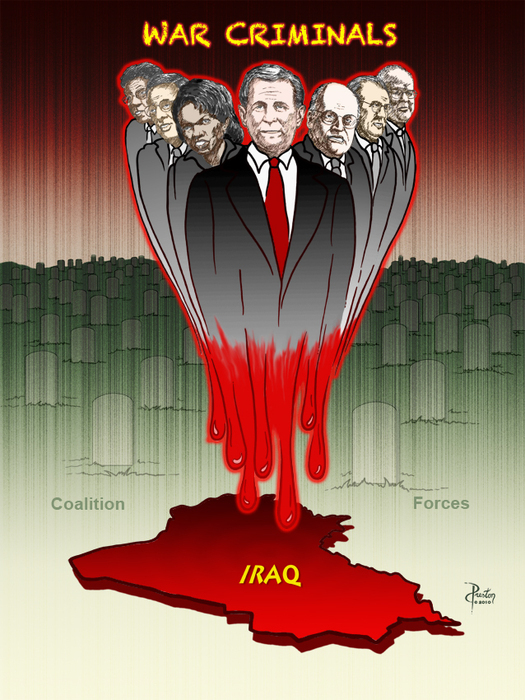 Created in photoshop and illustrator, this piece is a political commentary on the policies of the Bush Administration regarding the Iraq war. 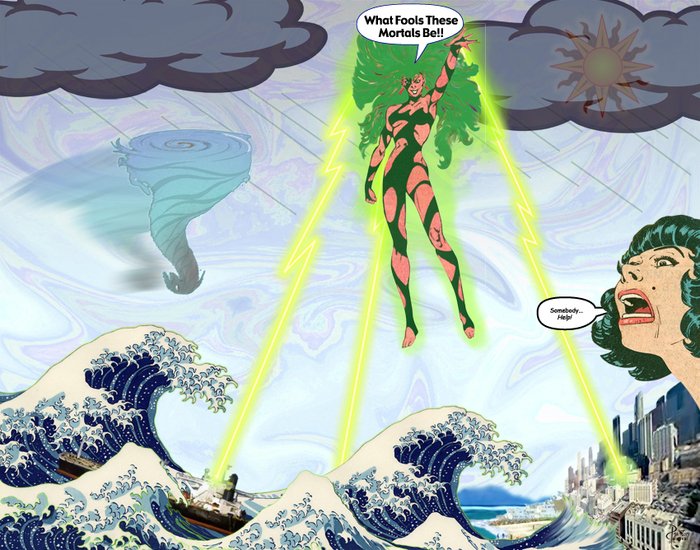 Created in photoshop and illustrator, this piece is a commentary on mankind's abuse of his environment and the resulting consequences as Mother Nature strikes back. 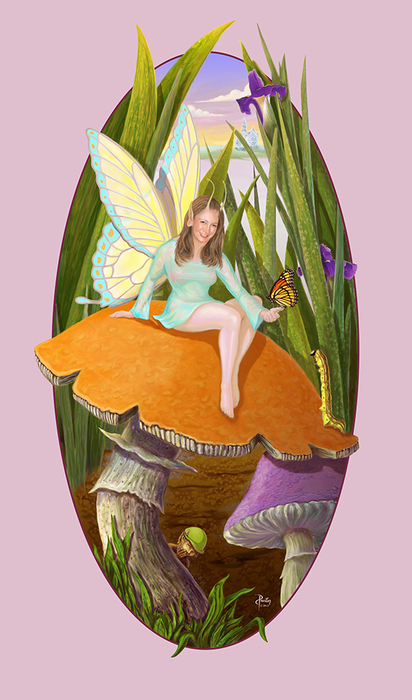 Created digitally in photoshop, painter and illustrator, this piece was a commission piece and depicts a fairy sitting atop a mushroom as she balances a butterfly on her outstretched finger while a caterpillar looks on and a little elf peers out at the viewer from underneath the mushroom. 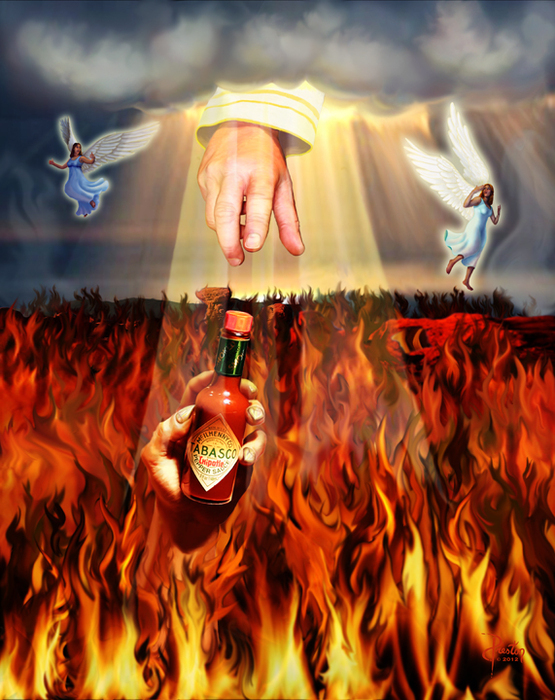 Created digitally in photoshop and illustrator as a tribute to Tabasco hot sauce, this piece depicts the hand of Satan reaching up from the fires of hell, holding a bottle of Tabasco, while God's hand reaches down from heaven to grab it. Two angels in the distance stop in mid-flight to look on the scene with a shocked expression. Created digitally in photoshop and illustrator, this is my interpretation of a quote from H.G. Wells. 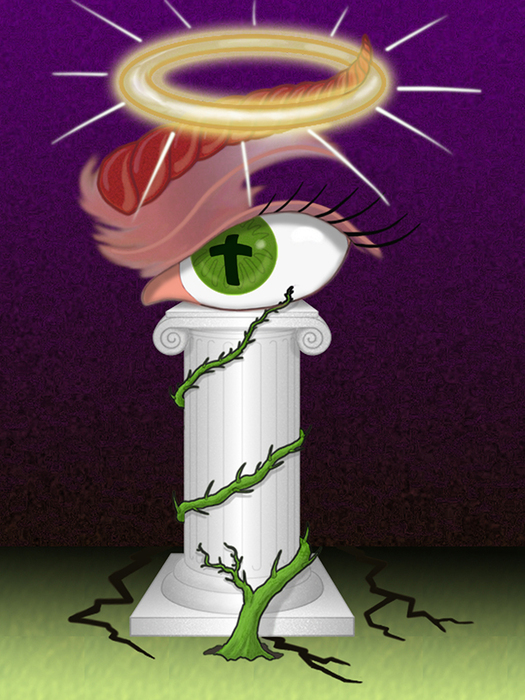 It depicts an eye sitting atop a white pedestal that has a green vine crawling up the side. An eyebrow is transformed into a horn that is surrounded by a halo. 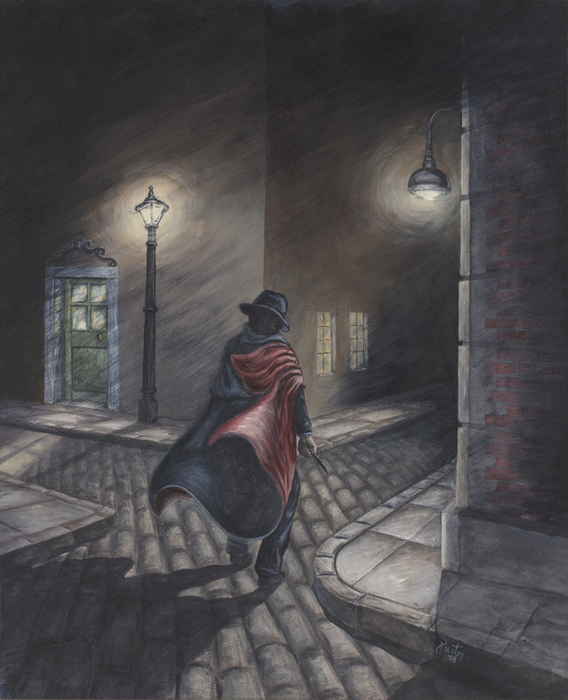 Created in Acrylic, this is a spec piece I created for an article on Jack-the-Ripper. Created in Acrylic, this is my interpretation of the like-named Beatles song. 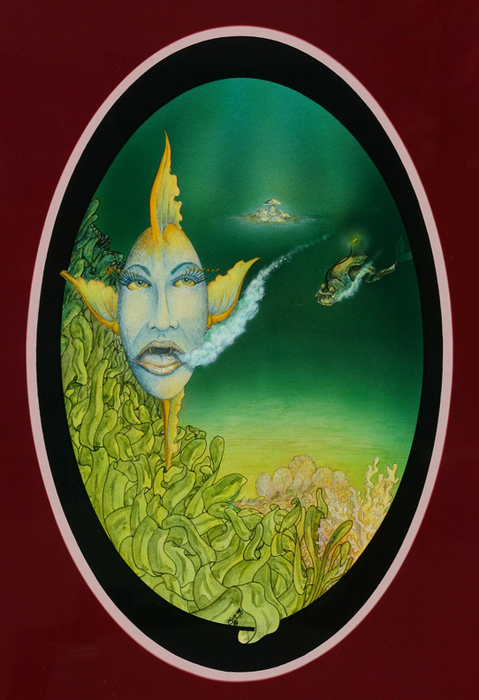 Created in airbrushed gouache, acrylic and prismacolor, this is a piece I created from a dream I had. 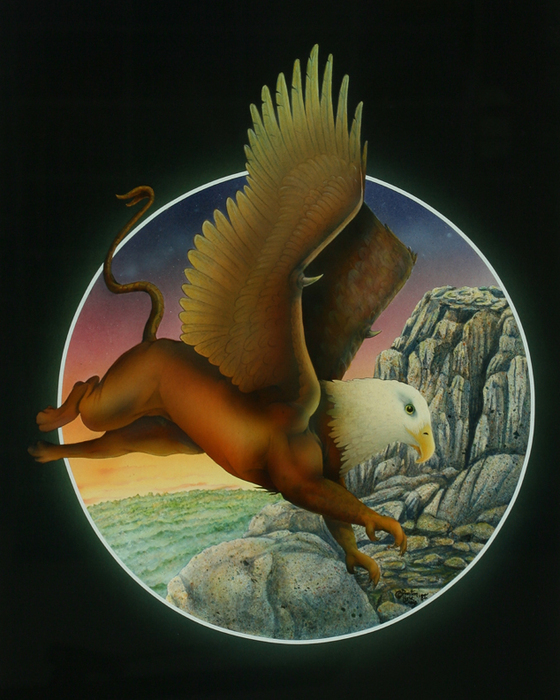 Created in airbrush Gouache, Acrylic and Prismacolor, this piece depicts the scene of an ancient mythological creature on the hunt. 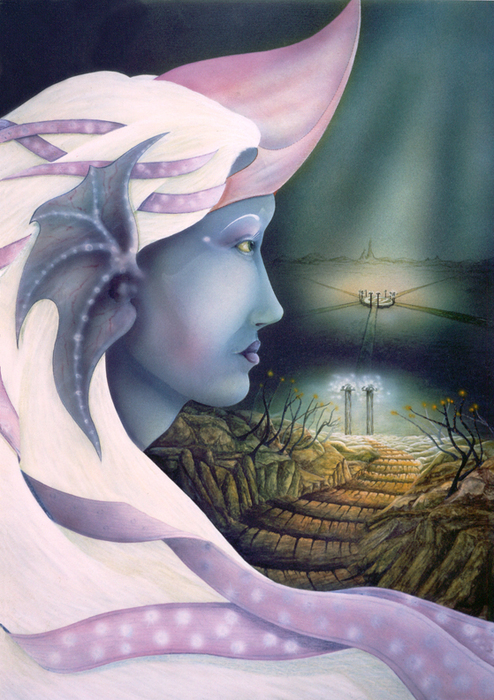 Created in airbrushed Gouache, Acrylic and Prismacolor, this piece depicts an undersea kingdom and the queen that reigns over it. 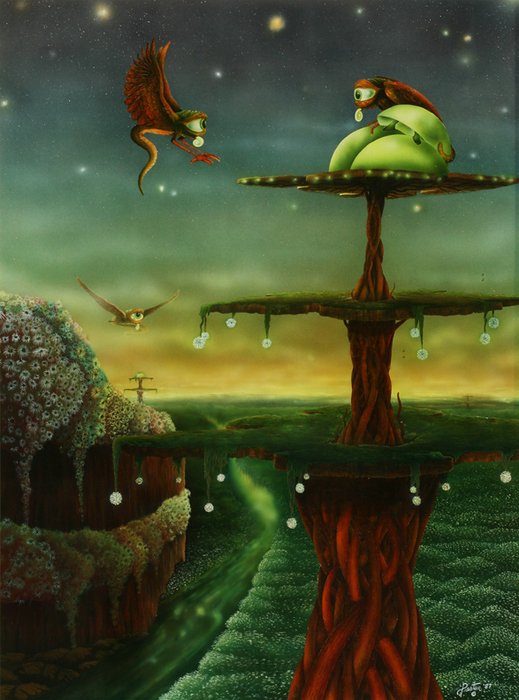 Created in airbrushed Gouache, Acrylic and Prismacolor, this piece depicts a scene on an alien world of a late night partier that is confronted by it's mate as it returns home in the wee hours. 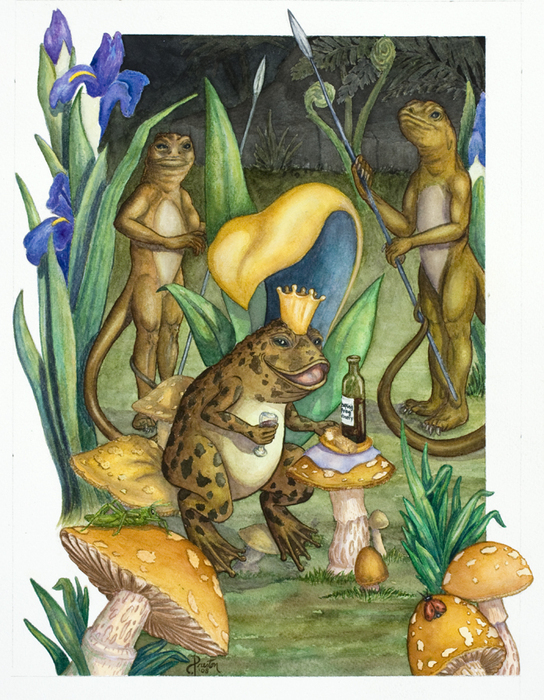 Created in Watercolor, this piece depicts a scene in which a toad king, flanked by lizard guards, sits on a mushroom to enjoy a lunchtime repast of wine, bread and cheese. Created in Watercolor and Prismacolor, this piece is my interpretation of a scene from the story of the same name by Oscar Wilde. 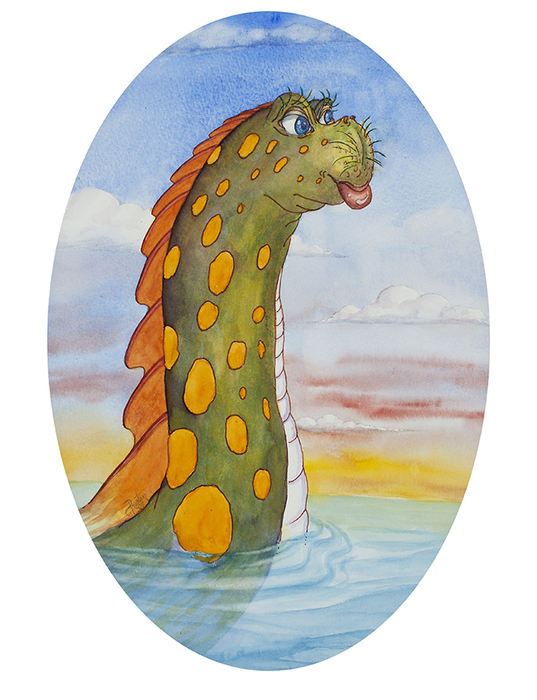 Created in Watercolor and Prismacolor, this piece is a tribute to a favorite childhood animated cartoon character. 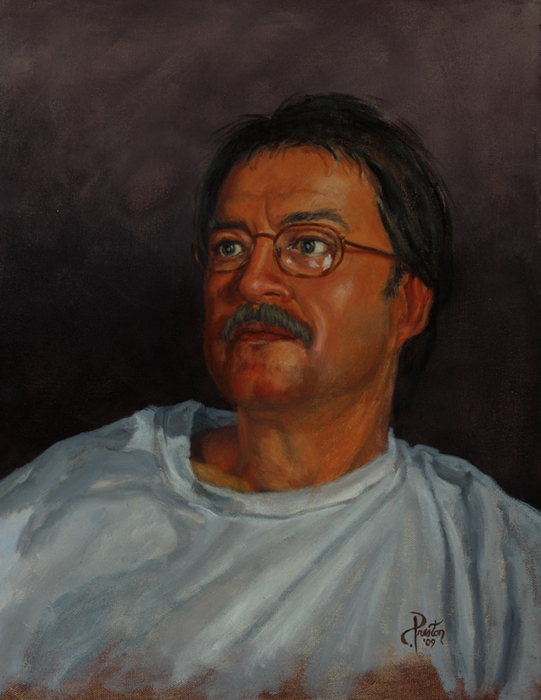 This is a collection of portraits I have created over the years, some as part of my M.F.A. program. Created in Acrylic, this is a portrait of a friend of mine that contains items that are important in his life. 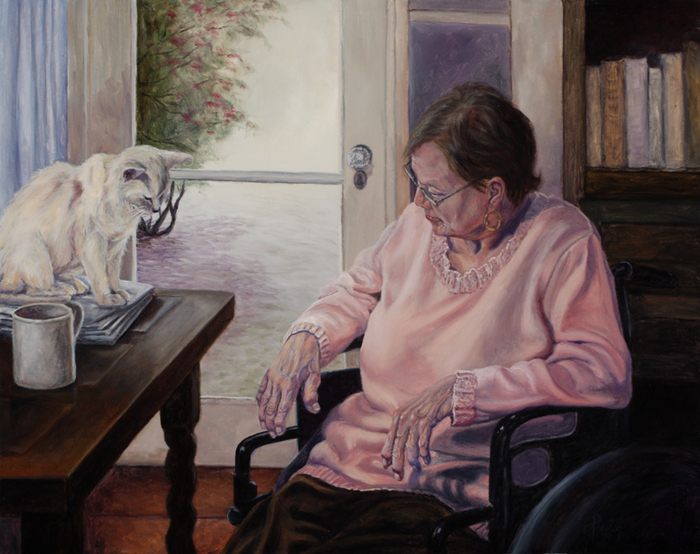 Created in Acrylic, this is a portrait of a friend and her favorite feline, enjoying a quiet moment in the kitchen dining area. Who will make the first move? 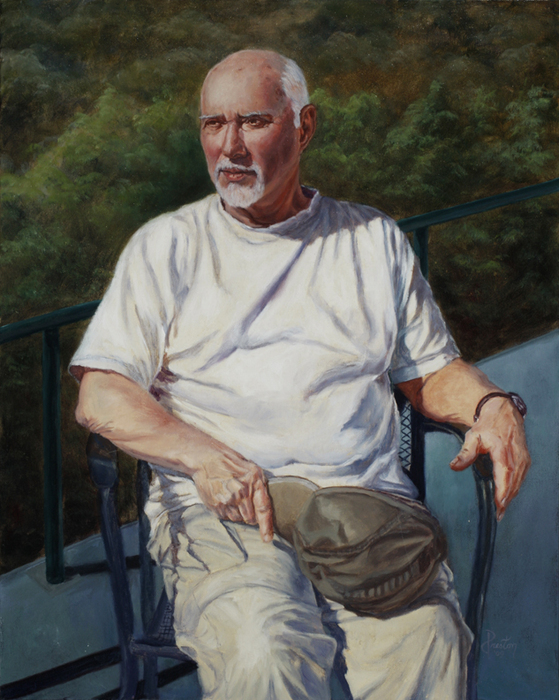 Created in Acrylic, this is a portrait of a close friend of mine as he enjoys some sun on his backyard patio. 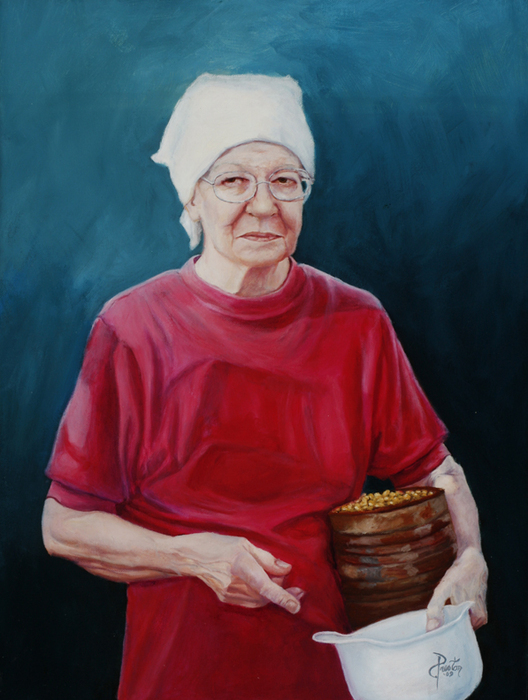 Created in Acrylic, this is a portrait of my mom as she prepares to feed some animals on her farm; a bucket of feed rest in the crook of her arm. 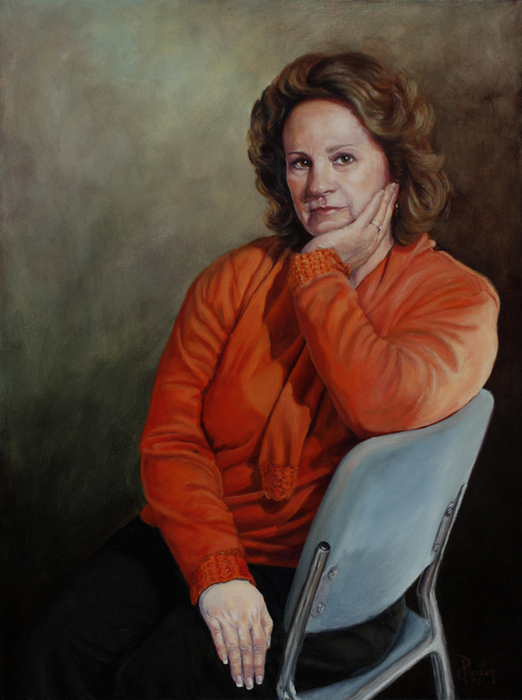 Created in Acrylic, this is a portrait of my next door neighbor where I once lived. 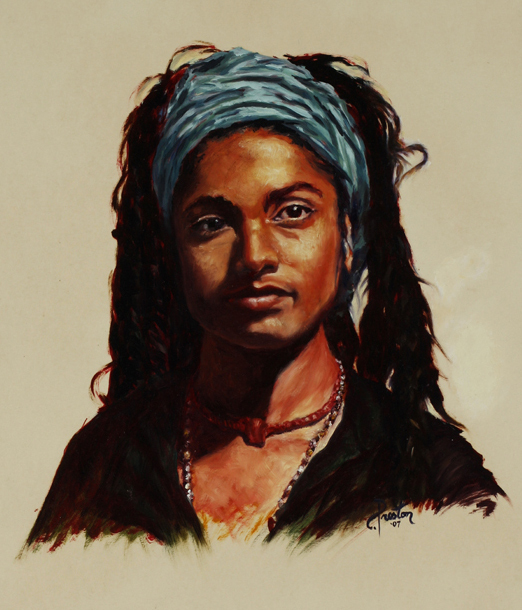 Created in Acrylic, this is a portrait of a model from a portrait class I once took. 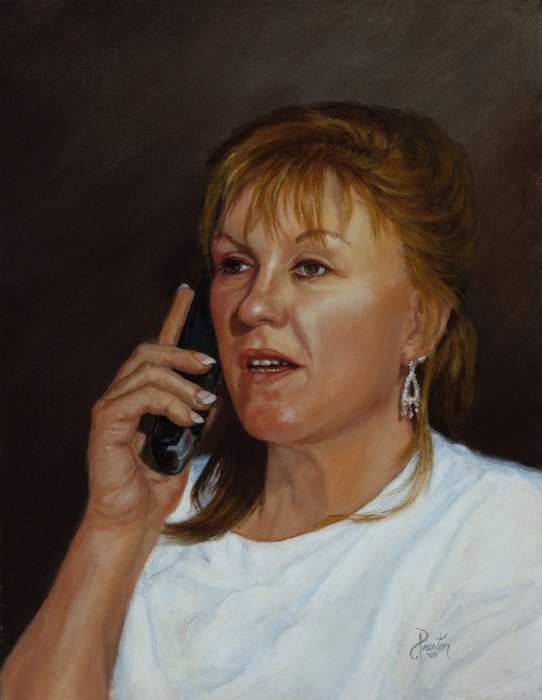 Created in Acrylic, this is a portrait of my sister Jan, who seems to live on the phone. 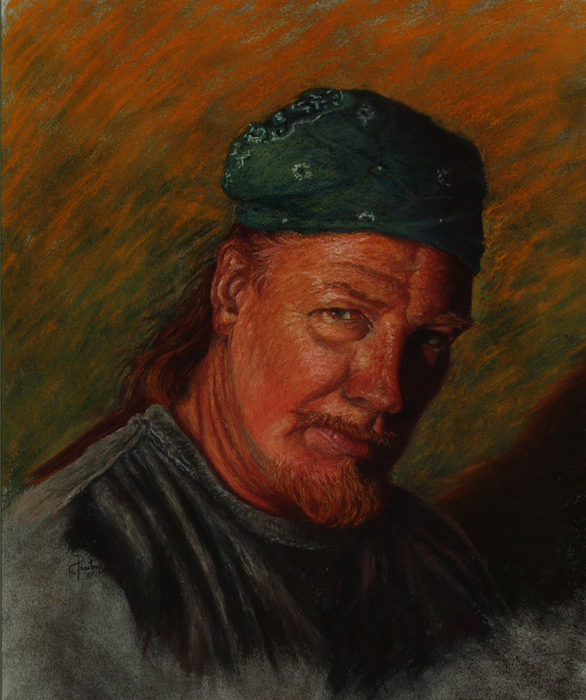 Created in Acrylic, this is a portrait of the brother-in-law who is married to my sister Jan. 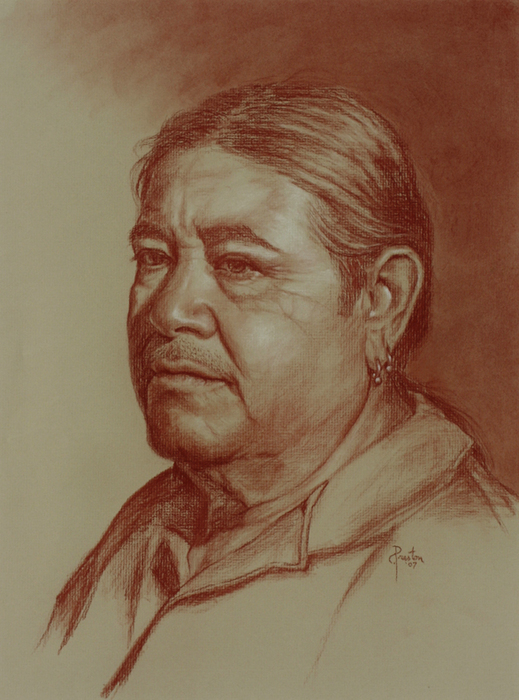 Created in Red & White Charcoal, this is a portrait of a next door neighbor where I once lived. He is married to Ann. 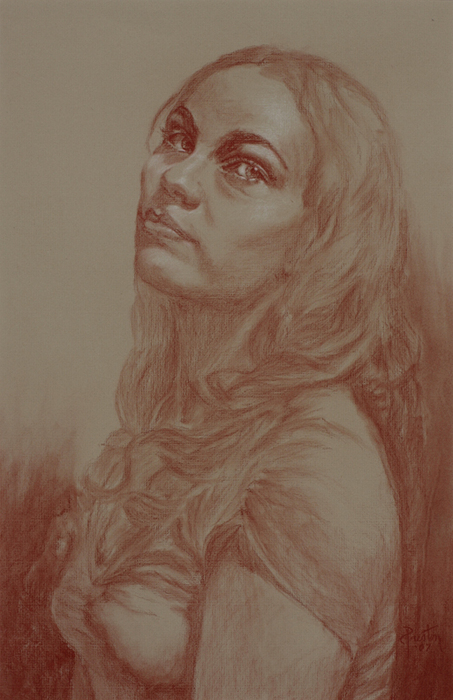 Created in Red & White Charcoal, this is a portrait of a model from a portrait class I once took. 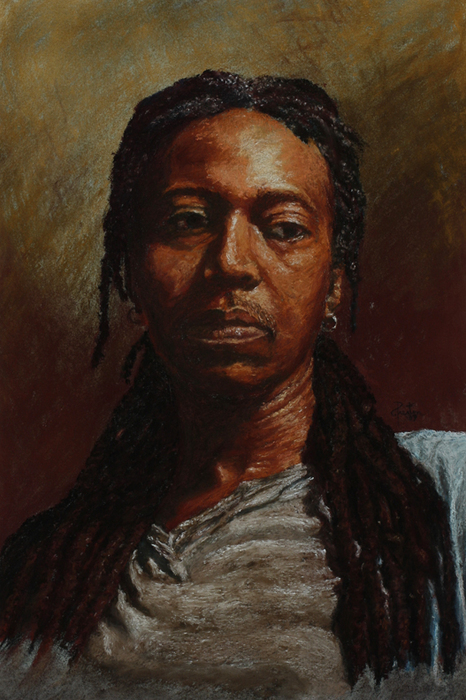 Created in Pastels, this is a portrait of a model from a portrait class I once took. 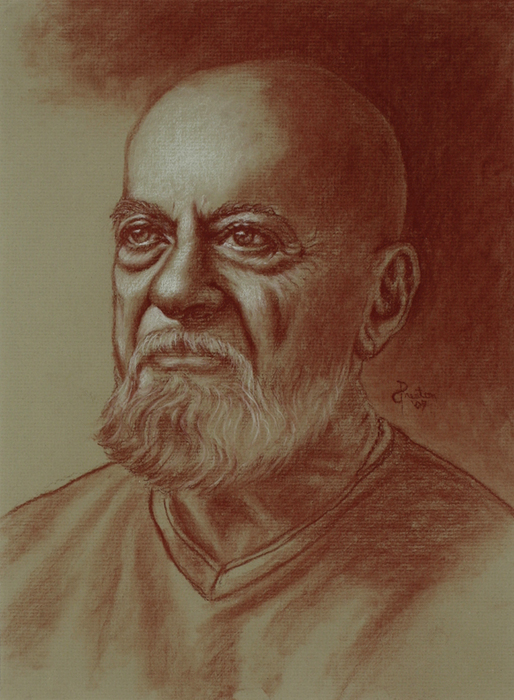 Created in Pastels, this is a portrait of myself. 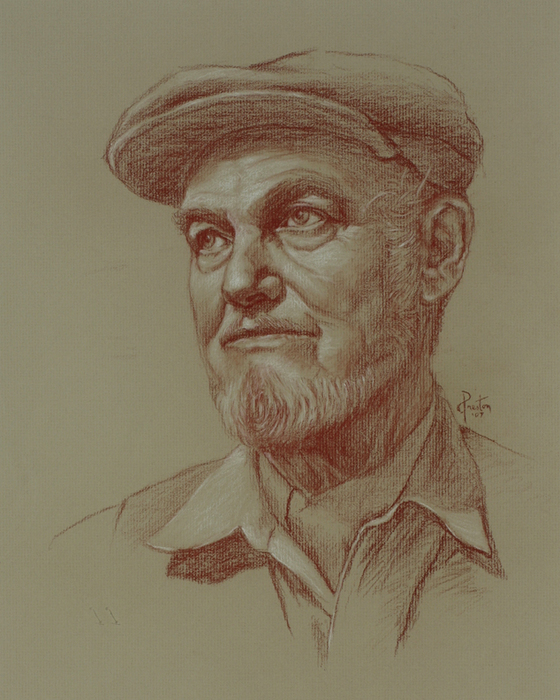 Created in Red & White Charcoal, this is a portrait of a Pan-type character using myself as the model. A variety of landscapes I have painted over the years. 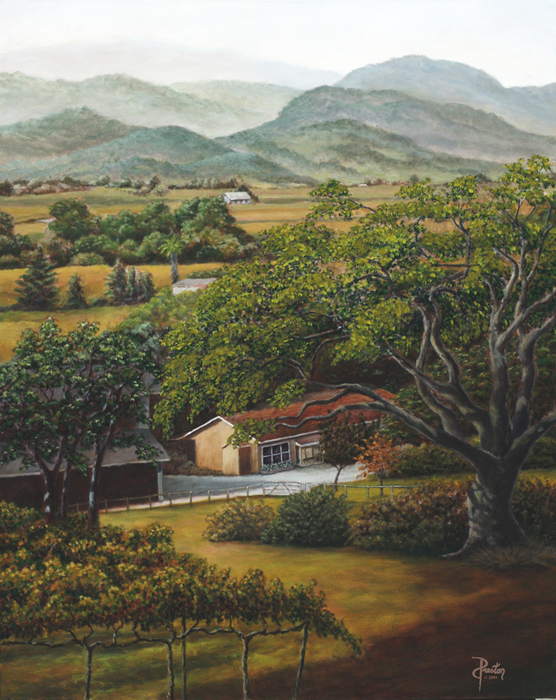 Created in Acrylic, this is a scene of a vineyard area in Napa Valley. 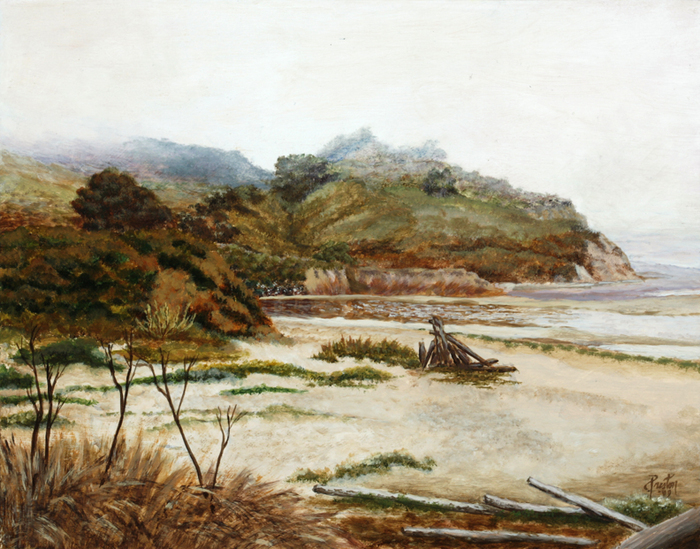 Created in Acrylic, this is an early morning scene of beach in Northern California. 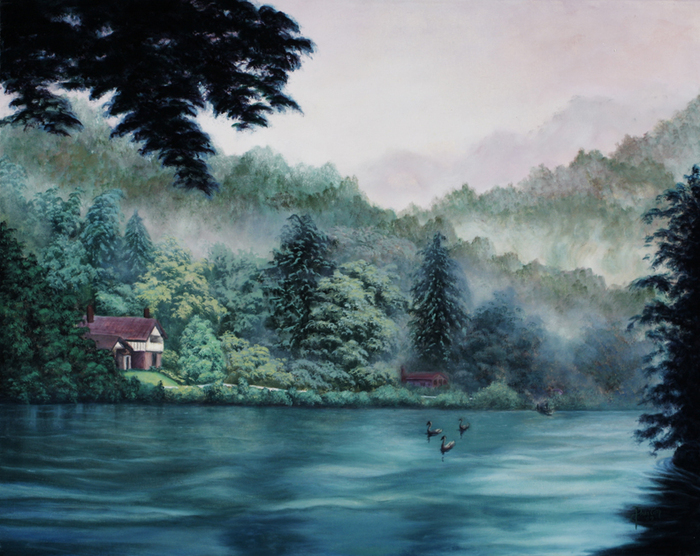 Created in Acrylic, this is an early morning scene, the fog still hovers in the trees, of a fantasy scene I created based on some photos I took when I lived in a house on the Thames River in England. 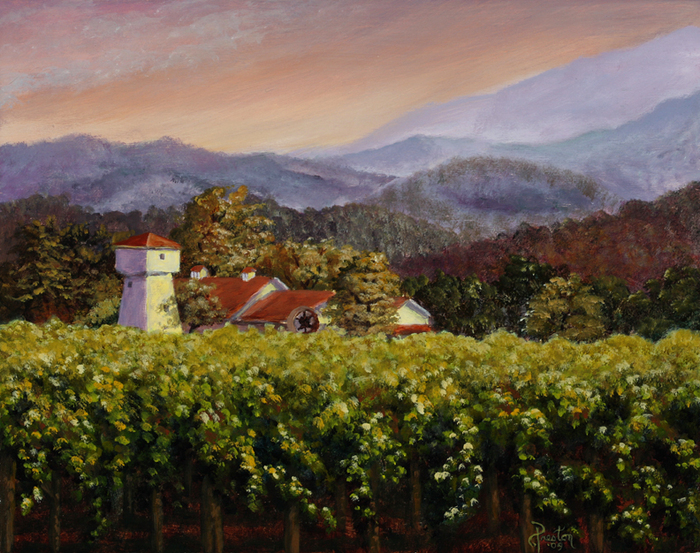 Created in Acrylic, this is a scene of a Napa Valley vineyard painted in a split-complimentary color scheme. 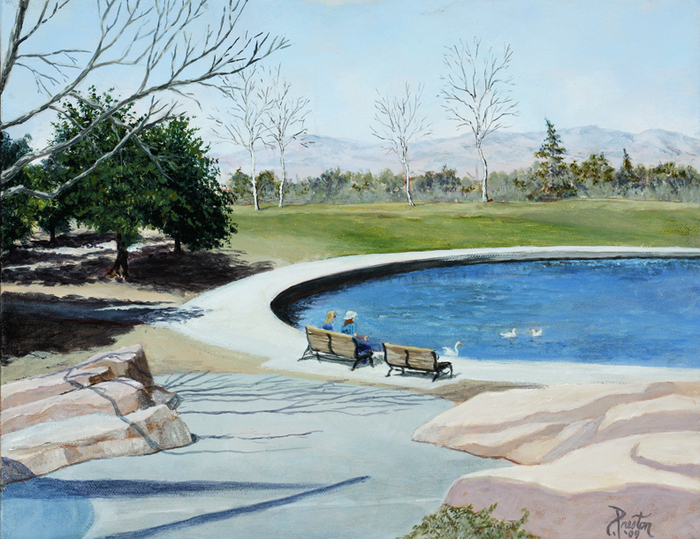 Created in Acrylic, this is a scene of a park area near where I once lived. 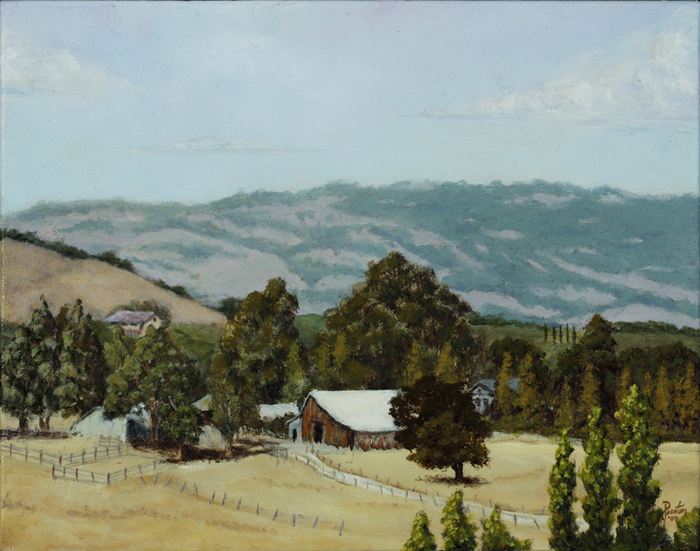 Created in Acrylic, this is a scene of a Northern California rural country setting. 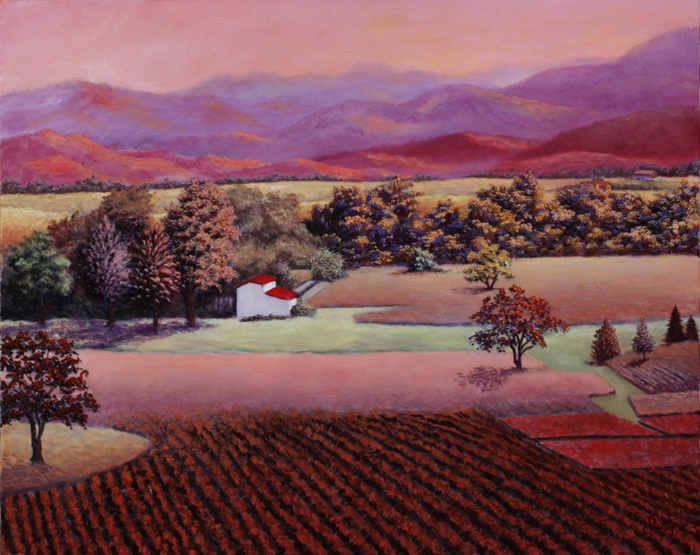 Created in Acrylic, this is a scene of a Napa Valley vineyard. 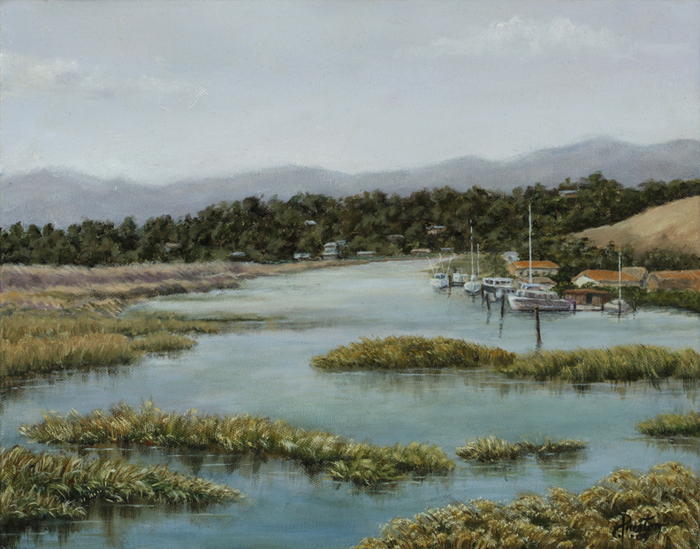 Created in Acrylic, this is a scene of a marshy boating area in Northern California. 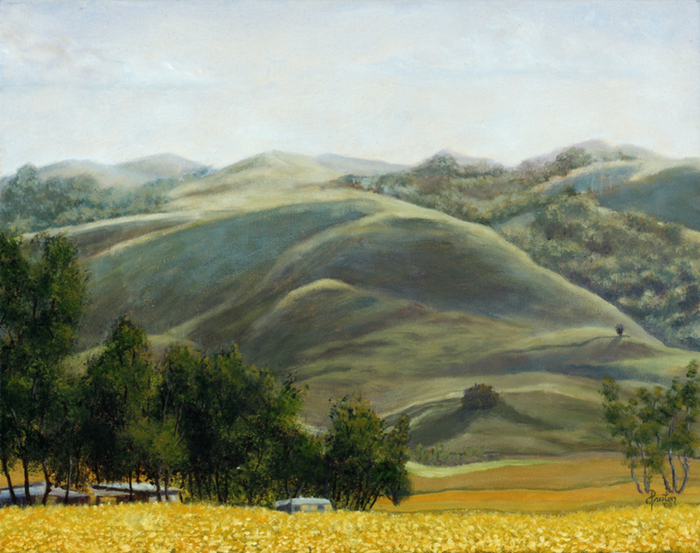 Created in Acrylic, this is a scene of a camping area in the foothills of the Northern California countryside. 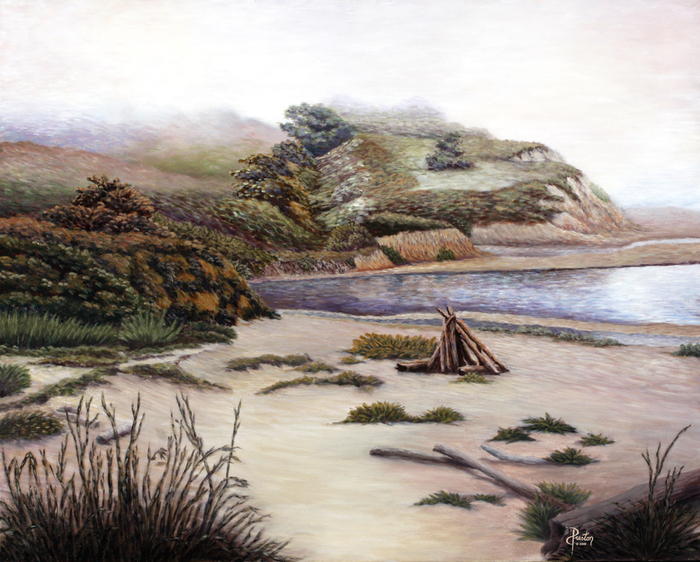 Created in Acrylic, this is a study I created of Pescadero Beach before I created the larger piece. 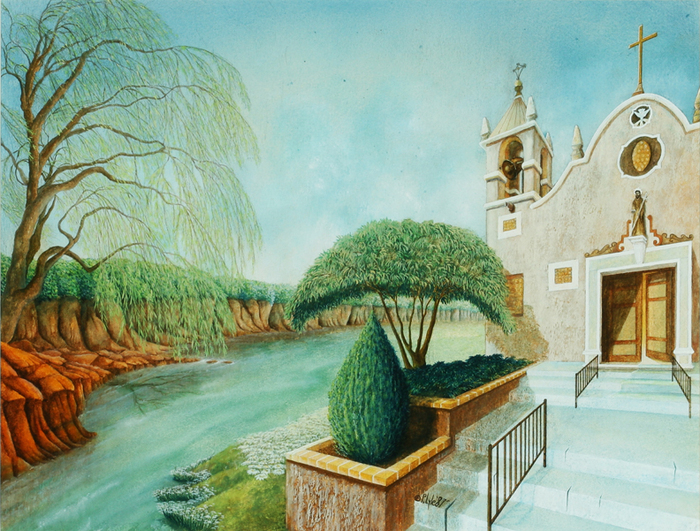 Created in Watercolor and Acrylic, this piece depicts a mission scene in Northern Louisiana. 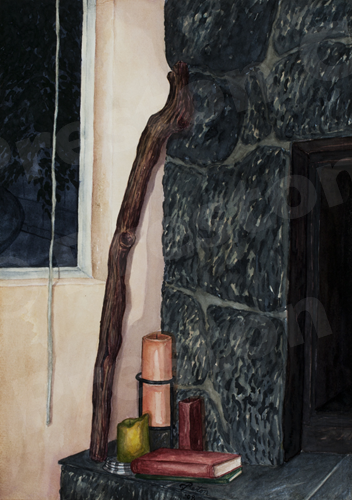 Created in Watercolor and Acrylic, this piece depicts a fireplace interior of a place where I formerly lived.